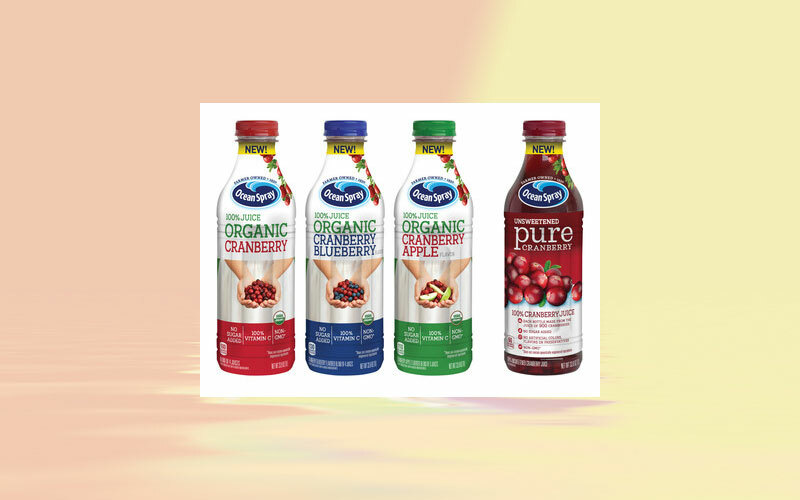 Ocean Spray, an agricultural cooperative owned by more than 700 cranberry farmers, announced that it has added two beverage lines to its extensive product portfolio: Ocean Spray® Organic 100 % Juice Blends and Ocean Spray® Pure Cranberry (Unsweetened) 100 % Juice. Ocean Spray® Organic 100 % Juice Blends are the perfect combination of organically grown North American cranberries from family farms, with other organic fruit juices. Organic 100 % Juice Blends contain no added sugars1, preservatives or artificial flavors and are available in three delicious flavors: Cranberry, Cranberry Apple and Cranberry Blueberry. All Ocean Spray® Organic 100 % Juice Blends are non-GMO2 and feature the USDA Organic seal (certified organic by QAI). Each flavor has 100 % Vitamin C per serving and each 8-ounce glass is equivalent to one cup of fruit. An 8-ounce glass of these blends contains 100-130 calories, depending on the flavor. For the pure, authentic taste and unique health benefits of the cranberry, Ocean Spray’s Pure Cranberry (Unsweetened) 100 % Juice contains no added sugars1, artificial flavors, preservatives or colors and is non-GMO2. Each one-liter bottle provides the health benefits from the juice of more than 900 cranberries! An 8-ounce serving is only 60 calories and is equivalent to one cup of fruit to support daily nutritional needs. The juice can be enjoyed on its own or added to smoothies or sparkling water for an extra health boost. Ocean Spray® Organic 100 % Juice Blend and Ocean Spray® Pure Cranberry (Unsweetened) 100 % Juice are available nationally in the US. The suggested retail price of Ocean Spray® Organic 100 % Juice Blends is $3.99 per 1 liter bottle, while Ocean Spray® Pure Cranberry (unsweetened) 100 % Juice is $5.98 per 1 liter bottle. 1 These products are not low calorie foods – see Nutrition Facts for sugar and calorie content. 2 These products do not contain genetically engineered ingredients.